/EINPresswire.com/ -- CAMBRIDGE, MA--(Marketwired - February 23, 2017) - Pegasystems Inc. (NASDAQ: PEGA), the software company empowering customer engagement at the world's leading enterprises, today announced results for its fourth quarter and full year ended December 31, 2016. "We're pleased with the solid results we delivered in 2016," said Alan Trefler, founder and CEO, Pegasystems. "To remain competitive, enterprises need to think differently about how to deliver always-on personalized customer engagement and achieve increasing levels of operational excellence. Our solutions are unique in their ability to empower our clients to not just manage these challenges but to leverage them for competitive advantage." "It's an exciting time at Pega," said Ken Stillwell, CFO, Pegasystems. "The rapid growth of recurring contractual commitments led to record license and cloud backlog, reflecting our new client wins and the increased spend from existing clients. This significant trend improves the predictability of our business and supports expanding margins as we grow." (2) We elected to early adopt Accounting Standards Update No. 2016-09, "Compensation-Stock Compensation (Topic 718): Improvement to Employee Share-based Payment Accounting" ("ASU 2016-09") in the fourth quarter of 2016. See the financial schedules at the end of this release for further information. License and Cloud Backlog: The Company computes license and cloud backlog by adding deferred license and cloud revenue as recorded on the Company's balance sheet and license and cloud contractual commitments, which are not yet billed and not recorded on its balance sheet. (2) See future cash receipts from committed license and cloud arrangements in a separate schedule at the end of this release. Recurring Revenue: The Company expects that our business will continue to shift away from perpetual licenses toward recurring revenue streams of term and cloud licenses. License and cloud contractual commitments grew by 31% year over year. 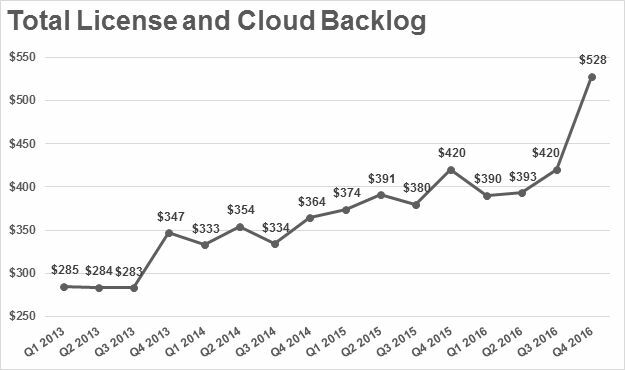 License and cloud backlog has continued to grow year over year, with significant growth of $135 million in the second half of 2016. Recurring revenue, which is term license, cloud, and maintenance revenue, compounded annual growth rate ("CAGR") was approximately 20% for the years 2013 through 2016, both GAAP and non-GAAP. Term license and cloud revenue CAGR was approximately 30% for the years 2013 through 2016, both GAAP and non-GAAP. (1) See reconciliation of our GAAP to Non-GAAP measures contained in the financial schedules at the end of this release. Full Year 2017 Revenue: GAAP and non-GAAP revenue for the full year 2017 is projected to be approximately $860 million. Full Year 2017 Earnings Per Share (2): GAAP diluted earnings per share for the full year 2017 is expected to be approximately $0.43. Non-GAAP diluted earnings per share for the full year 2017 is expected to be approximately $1.00. (2) See the reconciliation of our GAAP diluted EPS guidance to non-GAAP diluted EPS guidance for the full year of 2017 at the end of this release. Pegasystems will host a conference call and audio-only Webcast associated with this announcement at 5:00 p.m. EST today. A live audio Webcast of the conference call, together with detailed financial information, can be accessed through the Company's Website at www.pega.com/about/investors. Dial-in information is as follows: 1-877-705-6003 (domestic) or 1-201-493-6725 (international). To listen to the Webcast, log onto www.pega.com at least five minutes prior to the event's broadcast and click on the Webcast icon in the Investors section. A replay of the call will also be available on www.pega.com by clicking the Earnings Calls link in the Investors section. "Safe harbor" statement under the Private Securities Litigation Reform Act of 1995: Certain statements contained in this press release may be construed as "forward-looking statements" as defined in the Private Securities Litigation Reform Act of 1995. The words "expect," "anticipate," "intend," "plan," "believe," "could," "estimate," "may," "target," "strategy," "is intended to," "project," "guidance", "likely," "usually," or variations of such words and similar expressions, among others, identify forward-looking statements, which speak only as of the date the statement was made. These statements are based on current expectations and assumptions and involve various risks and uncertainties, which could cause the Company's actual results to differ from those expressed in such forward-looking statements. These risks and uncertainties include, among others, variation in demand for our products and services and the difficulty in predicting the completion of product acceptance and other factors affecting the timing of our license revenue recognition; the ongoing consolidation in the financial services, insurance, healthcare, and communications markets; reliance on third party relationships; the potential loss of vendor specific objective evidence for our time and materials professional services arrangements; the inherent risks associated with international operations and the continued weakness in international economies; foreign currency exchange rates; the financial impact of the Company's past acquisitions, including the OpenSpan acquisition, and any future acquisitions; the potential legal and financial liabilities and reputation damage due to cyber-attacks and security breaches; and management of the Company's growth. Further information regarding these and other factors which could cause the Company's actual results to differ materially from any forward-looking statements contained in this press release is contained in the Company's recent filings with the Securities and Exchange Commission. These documents are available on the Company's website at http://www.pega.com/about/investors. The forward-looking statements contained in this press release represent the Company's views as of February 23, 2017. Investors are cautioned not to place undue reliance on such forward-looking statements and there are no assurances that the matters contained in such statements will be achieved. Although subsequent events may cause the Company's view to change, except as required by applicable law, the Company does not undertake and specifically disclaims any obligation to publicly update or revise these forward-looking statements whether as the result of new information, future events or otherwise. The statements should therefore not be relied upon as representing the Company's view as of any date subsequent to February 23, 2017. Pegasystems Inc. (NASDAQ: PEGA) develops strategic applications for marketing, sales, service, and operations. Pega's applications streamline critical business operations, connect enterprises to their customers seamlessly in real-time across channels, and adapt to meet rapidly changing requirements. Pega's Global 3000 customers include many of the world's most sophisticated and successful enterprises. Pega's applications, available in the cloud or on-premises, are built on its unified Pega® Platform, which uses visual tools to easily extend and change applications to meet clients' strategic business needs. Pega's clients report that Pega software gives them the fastest time to value, extremely rapid deployment, efficient re-use, and global scale. For more information, please visit us at www.pega.com. (1) We adopted ASU 2016-09 in the fourth quarter of 2016. Upon adoption, excess tax benefits generated when stock awards vest or settle are recognized as a reduction to the provision for income taxes instead of in equity. We are required to reflect any adjustments as of January 1, 2016, the beginning of the annual period that includes the interim period of adoption. As a result of the adoption, we recognized a reduction to our provision of income taxes of $6.7 million for the year ended December 31, 2016. Other adjustments: We reached an agreement with the former shareholders of Antenna Software, Inc., which we acquired in October 2013 ("Antenna"), to release a portion of the funds held in escrow as security for their indemnification obligations to us in settlement of the outstanding indemnification claims. The settlement resulted in a benefit to cost of revenue and operating expenses in the first quarter of 2015. In addition, we favorably settled indirect tax liabilities related to the Antenna acquisition, which resulted in a benefit to operating expenses in the first quarter of 2015. We believe the benefits associated with these items are not representative of our ongoing business, and we have excluded the effects of these items from our non-GAAP operating results and net earnings measures. (4) The GAAP income tax effects were calculated using an effective GAAP tax rate of 18.2% and 42.6% for the fourth quarter of 2016 and 2015, respectively. The non-GAAP income tax effects were calculated using an effective non-GAAP tax rate of 37.0% and 36.0% for the fourth quarter of 2016 and 2015, respectively. The GAAP income tax effects were calculated using an effective GAAP tax rate of 23.3% and 40.0% for the full year 2016 and 2015, respectively. The non-GAAP income tax effects were calculated using an effective non-GAAP tax rate of 34.9% and 35.1% for the full year 2016 and 2015, respectively. The differences between our GAAP and non-GAAP effective tax rates for the fourth quarter and full year 2016 and 2015 primarily relate to the impact of the adoption of ASU 2016-09 in the fourth quarter of 2016 and the impact of unfavorable foreign stock compensation adjustments on our GAAP effective tax rate. (1) We retrospectively adopted ASU 2015-17 "Income Taxes (Topic 740): Balance Sheet Classification of Deferred Taxes" in the fourth quarter of 2016 and reclassified $12.4 million of current deferred tax assets to long-term deferred income tax assets at December 31, 2015 to conform with current year presentation. (1) We adopted ASU 2016-09 in the fourth quarter of 2016. Upon adoption, excess tax benefits generated when stock awards vest or settle are required to be presented as an operating activity rather than a financing activity in the statement of cash flows. We are required to reflect any adjustments as of January 1, 2016, the beginning of the annual period that includes the interim period of adoption. We retrospectively adopted this new guidance and reclassified $5.3 million from financing activities to operating activities for the year ended December 31, 2015. (1) These amounts are for perpetual licenses with extended payment terms and/or additional rights of use.